ANCHORAGE, AK- Climb For America’s Children, a non-profit corporation founded to raise funds for children in need, has teamed with A Child Is Missing, a non-profit corporation, assisting police through their "National Command Center" in the first few hours of a child’s disappearance (which can determine whether they live or die). With over 3,000 children missing a day in America alone, there is a serious need. The organizations will be holding a World Press Conference on March 19, 2002 at 10:00 am at the Hilton Anchorage in Anchorage, Alaska. Alaska is the staging platform of the "The World’s First Next Generation Telethon," The Climb For America’s Children Denali 2001-2002 Expedition, An Extreme Sport Charitable Event, which will promote the national awareness campaign and A Child Is Missing’s program and its Alaska expansion. 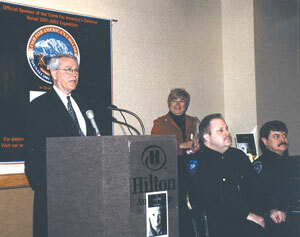 The presenters are Mayor George Wuerch, Anchorage; Mayor Sarah Palin, Wasilla; Chief Walt Monegan, Anchorage Police Department, Sherry Friedlander, Founder, A Child Is Missing, and other notables. At that time, Climb For America’s Children and A Child Is Missing will announce plans for its "NeXt Generation Telethon," which features the first nationally televised ascent of Denali (Mount McKinley) for charity, known to be one of the most hostile expeditions in the world, with a vertical relief greater than any mountain on the planet (18,000 Feet ) and a summit at 20,320 Feet, America’s tallest mountain. The climbers include world famous celebrities, guides, photographer and film crew. Over 30 of today’s hottest celebrities have been invited to a participate as hosts or climbers for this event, along with John Walsh, of America’s Most Wanted to host and Dr. Laura Schlessinger to co-host this major event. Such noted names as Michael Jordan, Arnold Schwarzenegger, Sylvester Stallone and Tom Cruise have also been asked to co-host and or climb to help save children’s lives in the first "NeXt Generation Telethon", in association with A Child Is Missing to raise funds for the "National Command Center" and heighten awareness of the "National Response System" that enables law enforcement officials to find missing children across America in the first few hours of their disappearance. The Climb For America’s Children promotional team is led by George LaMoureaux, Founder, who also founded The Cartoon Channel, Toon TV, and is a National Advisory Board Member of A Child Is Missing; Thomas Madden, author of "Spin Man," - the inside world of public relations and is a former director of public relations of ABC Television and Vice President of NBC Television, who now heads up TransMedia, a public relations firm he founded; and Dr. Ginger Southall, television fitness celebrity and nationally syndicated health and fitness writer who is also one of the climbers for this event. Guides and Climbers include 25 year Denali Guide Gary Bocarde of Mountain Trip plus three of his climbers, Photographer Myron Rosenberg, Movie Producer and Director Matthew Ogens of ESPN Sports and his film crew, Alaskans John Majors, Eric Oaks and three other major celebrities to be announced. Additional support has been formally confirmed by: World Famous Expedition Leader Colonel Norman D. Vaughan who will be a commentator and base camp participant with recognitions from the Explorers Club Royal Geographic Society, National Geographic, Admiral Byrd and the U.S. Congress. Vaughan said, "The Child Is Missing program will find the lost and bring them back: An answer to our social weakness, the Climb for America’s Children publicizes this great quest for our precious souls. Each footstep up Denali will symbolize getting closer to finding America’s Missing Children. I congratulate the team’s fortitude to climb Denali and passion to find our lost children. Colonel Vaughan’s motto in life is "Dream Big And Dare To Fail " - he is 96 years old. Further written support and positive comments came from, George W. Bush, President of the United States who said, "to convey his best wishes for a successful event." Florida Governor Jeb Bush, who said, "More than 3,000 children are reported missing everyday. We need to increase public understanding and awareness of this problem to prevent this alarming rate from continuing. I appreciate your commitment to your community and the contributions you have made to enhance both our way of life and our society as a whole." Congressman Mark Foley Co-Founder of the Congressional Missing and Exploited Children’s Caucus and Chairman of the Entertainment Task Force said, "Everyday that passes, more than 3,000 children are reported missing, and most Americans have no idea this is even occurring. As Co-Founder of The Congressional Missing and Exploited Children’s Caucus and Chairman of the Entertainment Task Force, I want you to know that you will have my full support in meeting the challenges you face. I can’t think of a more worthy cause, I know it will be a huge success." Alaska Governor Tony Knowles, said, " I applaud your efforts in organizing this extreme sport charitable event to raise funds for the "National Command Center." Heightened awareness of the "National Rapid Response System" will enable law enforcement officials to find missing children across the country, a truly worthy cause. Your selfless commitment to the success and the future development of " A Child Is Missing is extremely impressive. On behalf of all Alaskans, thank you for your dedication to serving our country and communities in the past, present and future." Former Alaska Governor William J. Sheffield, said, "You will make Alaska proud that you have come up with this interesting way to assist in raising funds to not only bring the program to Alaska but to help other states and the children in those states. The awareness to the public that your climb will generate will alert the families in their time of need that there is immediate help for them to find there child that is missing in the first hours of their disappearance. The Climb For America’s Children event and A Child Is Missing program is so very important to this country. You have my support." Former Alaska Governor and Secretary of The Interior Walter J. Hickel Sr. said, "Something this horrifying needs to be dealt with in an immediate and strategic manner. Your support for the National Command Center and the National Rapid Response System ( now nationwide because of your fundraising campaign ) has enabled and will continue to help law enforcement officials to find missing children here in Alaska and across the nation. This is a noble cause that needs broad support." Additional support and positive comments came from The Mountaineering Club of Alaska, The American Alpine Club, The American Mountain Guides Association and too many others to list. A Child Is Missing’s Board of Directors and Advisory Board looks like the who’s who of Law Enforcement, and the Founder Sherry Friedlander was awarded the coveted "J. Edgar Hoover Award for Distinguished Public Service" by the National Association of Chiefs of Police. Early Sponsors and Suppliers include; Alaska Glacier Beverages, Inc.; Ramada; Capital Bonding; Phoenix Worldwide Industries, Inc.; Alaska Mountaineering and Hiking, Inc.; Dana Design; Mountain Trip; Doug Geeting Aviation; Alaska Web Design; Alaska Stock; Evergreen Mint; LEKI USA; Ziffco; Ziffco Outer limits; Zuffun; Adventure Quest, Inc. Sportstat / Nonin; C.E. Tanner and Associates; The LM Berry Company; Lynden Transport; Lynden Air Freight; Nielsen Kellerman; Survival On Snow, Inc.; Atlas Snow-Shoe Company; Business in Broward Magazine; American Innoteck; The Hilton Anchorage with more to follow.